So do you know what I did? No, I didn’t banish him from my presence, my home, and the whole of Africa. I made hummus. Blender ready? Dump in the chick peas, tahini, salt, cumin, lemon juice, and garlic. Blend until smooth, adding a little of the chickpea juice at a time until it reaches your preferred consistency. I ended up using almost a whole can of juice. Transfer to a container and chill in the fridge for at least 30 minutes, since the hummus will be warm from the blender! Chop your pepper into inch-long slices, spread out on a baking sheet, and bake in the oven at 350°F (170°C) until roasted. (The tips will be slightly blackened.) Put in a ziploc or container in the fridge. 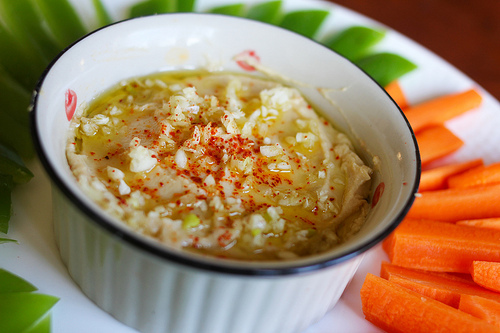 To serve, put hummus in a bowl, smoothing the top. Add just enough olive oil to cover the surface, and sprinkle with freshly minced garlic and paprika. 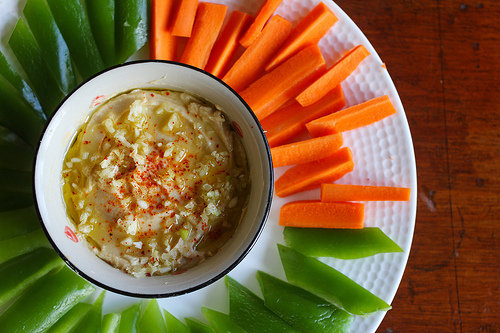 Add the roasted red pepper.5 Serve with carrots, green pepper, crackers, bread, or anything else you think might benefit from immersion in hummus. One of my father’s very favorite anecdotes about me involves hummus. As a child, I was regularly taken to various national parks across the western United States, some of them volcanic. One fateful day when I was about four years old, my dad decided to tell me a little about the rock cycle and pumice, the amazing sponge-like rock that weighs so little that it can float on water. Unfortunately, this was also the day he decided to introduce me to hummus, and pulled out a container of it for lunch. Upon hearing that I was expected to eat volcanic rock, I shrieked with horror, ran up a cinder cone, and refused to eat hummus until midway through my college years. So i decided to comment your blog but “I want hummus” first. PS: Serena makes the best hummus i ever had.